ANDERSON: Bass to 2 pounds are being caught by those dragging jigs off points or casting Lucky Craft jerkbaits. 408-927-9144, 408-463-0711. BERRYESSA: There's a decent spoon bite for bass. Don't expect much size or great numbers of fish, but it's a start. Kokanee fishing is done. 916-502-3474, 707-372-7599. CALERO: There's a good grass bite. Punch, flip or use frogs for bass. The weeds are getting thicker. As an alternative use drop-shots or shaky heads. Crappie are in the south end or near dam. Use small minnows or red worms. 408-463-0711. CHABOT: Trout bite hasn't kicked in despite two plants, but catfish are a good option. Ken Cruz on Monday caught three cats weighing 9, 8 and 4 pounds with mackerel near Coots Landing. 510-247-2526. CHESBRO: Bass bite is good for those throwing Senkos or Brush Hogs. Frogs also will work in vegetation. Crappie bite is decent near dam. Catfish bite is fair, but don't expect fish larger than 2 pounds. 408-463-0711.
shrimp or chicken liver. Crappie are biting with jigs or worms along shore at Boat Ramp or Loma Island, also from a boat. 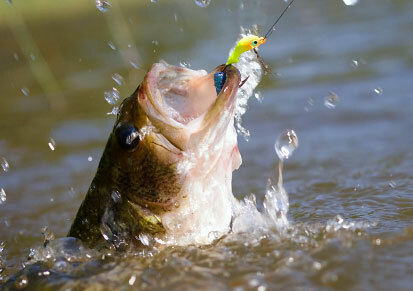 Black bass are biting lures or night crawlers anywhere around the lake. Trout are not biting. Matilde Quiroga of Antioch landed catfish weighing 7 and 4 pounds at Loma Island. 510-544-3154.COYOTE: Bass are between summer and fall transition. Lake level is dropping and weed mats that usually grow over deeper water haven't grown. Bass are suspended, as a result. 408-463-0711. DEL VALLE: Tough going. Trout plants haven't begun, and the 500-pound plants of cats aren't triggering much of a bite. 925-449-5201. LAFAYETTE: Trout bite is starting to kick in although plants haven't begun. Catfish bite is on the south end from boats and shore. Cutbaits or Power Bait get catfish. 925-284-9669. LEXINGTON: There's a consistent bite for small bass. Shallow-running crankbaits and jerkbaits will work. 408-463-0711. LOCH LOMOND: Bluegill bite is best. Bass bite early and then shut down. Lake is open next two weekends before closing for the year. 831-335-7424. LOS VAQUEROS: Last day to rent boats will be Oct. 9. Boat docks are being replaced and moved. Facilities will reopen in May, and shore fishing will continue through the winter. A 21.2-pound channel cat was caught with anchovies by Arturo Millan of San Jose while fishing near Howden Cove. A 17.3-pound cat was caught the same day by Mike Armstrong of Manteca. Biggest stripers were two 13-pounders caught from boats. 925-371-2628. QUARRY LAKES: Trout fishing is improving as weather cools and weekly plants take place. Biggest trout was a 5.8-pounder caught from a boat. Catfish bite has slowed. 510-544-3130. SAN LUIS RESERVOIR: Jumbo minnows, pile worms, anchovies or swimbaits will take stripers at Dinosaur Point, Basalt and Portugeuse Cove. Some stripers have weighed 10 to 15 pounds. Forebay also is decent for those throwing swimbaits or topwater baits in shallow water. 408-463-0711. SAN PABLO RESERVOIR: Trout fishing remains slow. Small spotted bass come from rock wall. Catfish bite is centered in Scow Canyon. Cast for Kids, an event to promote fishing among handicapped children, is Oct. 8. Volunteers are needed. 510-223-1661. SHADOW CLIFFS: Catfish are biting best, but trout are being planted. South side of swim area is best cat spot. 510-544-3230. UVAS: Drop-shotting finesse worms or jerk grubs gets bass. Crappie bite is good with jigs and red worms. 408-463-0711. NAPA: Striped bass are moving into Napa. Some are 12 pounds and some bigger. Rattletraps or worm-tail jigs are good offerings. Trollling Rattletraps or Rebels will get bass. 707-255-5544. BENICIA: Salmon bite has slowed and wait is on for fish outside Golden Gate to make their move. Stripers 26 to 28 inches are taking bullhead from 12th Street, Ninth Street and Third Street and state park. Crabs are a problem. Sturgeon bite is good in shallows. 707-745-4921. FRANKS TRACT: Schoolie stripers are occupying most anglers. Big Hammer swimbaits and Rattletraps get bass 6 or 7 pounds. A few go larger than 10. Black bass are starting to turn on. Topwater buzz baits, Zara Spooks and punching grass line will result in bass. 925-625-2441. PITTSBURG: Striper fishing is hit-and-miss. Most are small but a few 12 to 14 pounds. There's a lot of debris in water. Sturgeon bite is picking up at PG&E, Buoy 32 and Collinsville. Shore anglers continue to hook salmon near PG&E plant. 925-252-0151. RIO VISTA: Trolling west bank is very good. Using live bullhead near Middle Grounds also works. Best stripers are 10 pounds, but few shakers. Things are really turning around. Firing Line, Middle Grounds, Honker Bay are good spots. 707-374-2372, 916-777-6498. BERKELEY: Salmon boats get 20 fish per boat, regardless of number of anglers. Quality is improving, and there are 15-pounders on every trip. Rock cod trips to Marin get limits. An albacore trip Sunday returned with three albies after an 80-mile run. 510-849-3333. CAPITOLA: Albacore are rumored to be 25 miles off Davenport. White sea bass are near Pajaro but in fewer numbers. A swell had dispersed much of the bait. 831-462-2208. EMERYVILLE: On Sunday, The New Seeker had nine limits to 18 salmon while mooching along the Marin County coast. Monday, the C-Gull II mooched 12 salmon for 11, The Salmon Queen and Sundance trolled for limits. 510-654-6040. MONTEREY: Skiffs are getting white sea bass near Pajaro and Del Monte Beach. Rock cod trips are getting full sacks. Albacore are 25 miles southwest of Monterey. 831-375-5951, 831-372-7440. PILLAR POINT: Sunday's trip on Tigerfish came back with 13 limits of cod. The New Capt. Pete had seven limits of rock cod from in front of Ritz-Carlton. Most recent island trip went to Farallons on Saturday and caught 35 limits and 14 ling cod. The Connie O had four limits of salmon from Rocky Point on Saturday. 650-726-7133, 650-726-2913. SAN FRANCISCO: Striped bass are coming from Genentech and Candlestick. Bass are schoolie size to 26 inches. Plugs or pileworms get fish. There's also halibut in the same area, but down to Brisbane. 650-589-3474, 510-703-4148. SAN PABLO BAY: California City puts out a salmon now and then. It was good last week, this week it's fair because of larger tides. Next week tides are favorable for better salmon fishing. Most have been 8 to 15 pounds, but recently there have been 15- to 20-pounders. Bass bite live bait or trolled jigs along Marin shoreline. Shorefishing is good for those employing bullhead, shiners or pileworms. 415-456-0321. SUISUN BAY: Striper bite is best at Buoy 2 and Seal Island. A 42-incher was caught by Tom Merrill of Martinez from Seal Island. Sturgeon are at Buoy 2 and Buoy 4. 925-229-9420, 916-777-6498.